After a considerable amount of interest and guest feedback, we are excited to finally announce the first date of Eichardt’s Whisky Club! 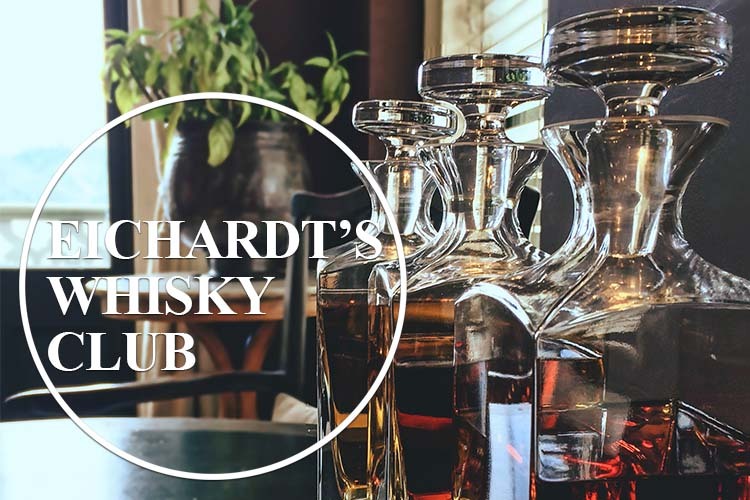 Eichardt’s Whisky Club will be a monthly event held in the luxurious surroundings of Eichardt’s Parlour. Each Whisky Club tasting session will be hosted by Scottish Sommelier, Neil Taylor (of Carrick Wines and previously Eichardt’s in-house Sommelier). Neil’s extensive knowledge of some of the finest single malts available will make for an educational and fun tasting of five different Whisky’s each month. The first tasting will be held on Thursday 11th December at 6pm and will feature a selection of very fine single malts from Speyside, Lowland, Highland, Islay and also something a little bit different / a little bit special. Light food to accompany the tastings is included. Seats for Eichardt’s Whisky Club will be limited and the atmosphere kept cosy and intimate in Eichardt’s Parlour. Tasting is priced: $25.00 for one guest, $40.00 for two guests & $70.00 for four guests.